THAT DAILY JOLT of ancient/modern wisdom, The Daily Stoic, recently delivered a short piece that should remind us how lucky we are in the modern world. 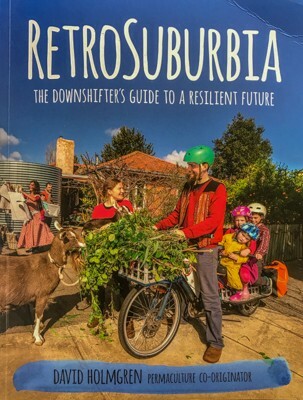 It is also a piece, I think, that resonates well with the retrosuburbia take on life promoted by permaculture co-inventor, David Holmgren, in his book of the same name. It’s so easy to take progress and luxury for granted… The more you are content with your surroundings, whatever they are, the more power you have… You can still fly first class if you like, just put it in its proper context. Which is to say, don’t complain if the satellite TV goes out when you’re over the Rockies or if they ran out of your preferred entrée option at meal service. Because, if you stepped back and looked at it historically, even in your own life, you’d see just how far ahead you’ve already come. Isn’t this true? Think back over our life and see how things have changed. My youth was spent in that dim, dark time unknown-to-many-young-people-today, that unimaginable world before the internet, before mobile phones, a time when computers took up entire rooms. We wrote on something called a typewriter, a noisy, clattering, electro-mechanical device that printed letters on paper… yes, paper… thin sheets made from trees. That’s why, rather than look for faults, I appreciate these new tools, these multiple purpose (bit of a permaculture concept there) digital devices we call mobile phones, computers, the internet, and how they have become the tools that assist what I and so many others do. But… but… what if it all stopped and those tools no longer worked? That’s a serious question, however for people like me it’s easily answered. We do what we did before those tools arrived. Tools, like everything else, are products of, and exist within, a particular socio-economic-political environment. There has always been an element of techno-pessimism in permaculture. You encounter it as a critique of modern technology and a preference for manual tools and old ways. Nothing wrong with those things, it is just that there is sometimes an assumption that old or manual = better. Is the use of horses to draw farm implements better than using a tractor? No. It is just different. Rather than adopt the competitive mindset of comparison, maybe we just accept that people prefer to do things in different ways. Some see those old ways as more sustainable than the new. They say that were an economic, ecological or similar crash to happen, those old ways would still be useable. Maybe so. If we take a broader view of a society-wide crash, perhaps we will ask whether the work those manual tools are doing will still be possible. Will there be markets for what they produce? Will whatever form a post-crisis society takes need to do the tasks the tools now do? Tools, like everything else, are products of, and exist within, a particular socio-economic-political environment. Will parts be available to keep those tools running? Take the bicycle. It is seen as a post-crisis transportation device because it is locally maintainable. But… is it? The skills of bicycle maintenance are widely available. Perhaps someone with the right machine tools could fabricate the metal parts needed to keep bicycles on the road. What, though, would they run on? Tyres, I mean. Not only are bicycle tyres imported, the rubber they are made from is also an imported product that grows only in specific tropical regions. Mechanical, manual, locally maintainable technologies are not necessarily sustainable in a time of crisis when imports become unavailable. Once, the permaculture critique of both modern and traditional tools and technology would have been informed by the ideas of EF Schumacher. Originally called ‘intermediate technology’, it later became known as ‘appropriate technology’. Schumacher positioned that technology as intermediate, as existing between hi-tech and traditional tech. Hi-tech, he wrote, was costly and difficult for local communities to maintain. Traditional tech was less-efficient than intermediate tech. An example of the application of intermediate tech might be the traditional cart pulled by horse or ox. Modern tech would replace it with a tractor and trailer or other motor vehicle. A time-proven technology, the device is less-efficient than it could be because the thin, wood and metal-rimmed, spoked wheels have a lot of rolling resistance and virtually no shock-absorbtion. Replace them with wheels from a motor vehicle, and suddenly you have a more-efficient means of transporting a load that has far-less rolling resistance and far more shock-absorbtion. That is the intermediate technology approach. With the growth in the number of technically-educated people, some of those hi-tech tools are now locally maintainable. The skills to maintain computer systems, for example, are widespread. What is needed, as for bicycles, is a store of spares to keep them running as long as possible. The utility of computerised systems is one reason they have crept into the appropriate technology field. The intermediate-tech understanding still exists in permaculture although not as extensively as it once did. It has largely disappeared as a frame of reference for discussing tools. How many permaculture design courses teach anything at all about technology and even mention EF Schumacher and intermediate-tech, like some once did? How many younger people coming into permaculture know of Schumacher? Especially for those who spend their hours ruminating over the potential for a socio-environmental crash, learning about the intermediate technology approach is relevant because it would be called into service to meet local needs. David Holmgren is a self-admitted techno-skeptic. That is different to being a techno-pessimist. A techno-skeptic takes a critical, questioning attitude to technology, and that is a good thing to do because it encourages rational assessment rather than unquestioning acceptance or rejection. David’s attitude to modern tech is at odds to the replies of some permaculture practitioners who, when the question of modern tech came up on social media, said it is better to adopt the modern tools because of their utilitarian value. I find David’s techno-skepticism, and other critical attitudes to modern tech in permaculture, of value as I have a long-running interest in technology and society. This led me to the situation where, rather than condemn today’s tools, I think it’s best we become materialists. Materialists, that is, who appreciate the useful stuff we own, who make a niche in our lives for it where it serves us like any good machine should, who care for it and appreciate its presence. This, rather than being that other class of materialists who, caught in the endless loop of consumption buy > use awhile > discard, then buy something new which follows the same cycle. This is why the Stoics spent so much effort trying to limit their attachments to various comforts. They worked at being self-contained — at not needing the newest or fanciest or most expensive new luxury — because they understood that it was not only ungrateful, it was a quest that only ever ended in disappointment. I think that will appeal to those exploring the potential for retrosuburban living and for the role of technology within it. It is the utilitarianism of modern tech, not the urge to have the latest and greatest that should be the determinant of the tech we adopt, old or new. And that makes stoicism, perhaps, the natural-fit philosophy for us as we draw on the wisdom of the past to make better our life in the present.